I didn't buy more than a handful of 2015 Topps packs and I don't think I picked up any 2015 Topps Update and so the very existence of the Etched In History cards was a surprise to me until my long time trading partner Reader Mike D. sent me one in our latest trade. The cards are essentially a thick metal coin inserted/glued into just about the thickest card stock I've ever seen on a card. 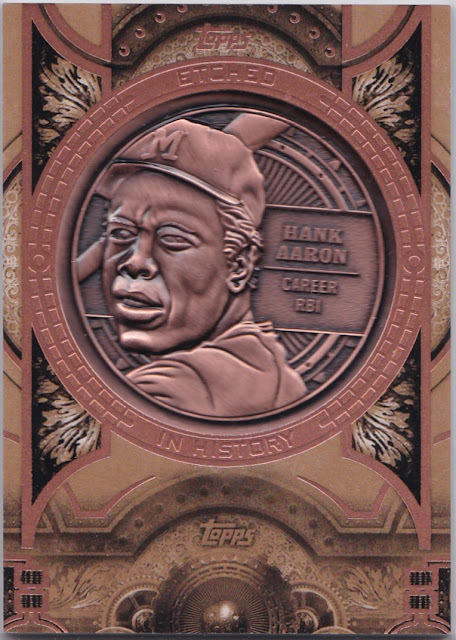 In total 15 Etched In History cards were included in the set and each features a player and a record that they hold. Other highlights include Ichiro, Ted Williams, and...Francisco Rodriguez? You might not remember that Rodriguez holds the single season save record with 62 which he set back in 2008 with the Angels. 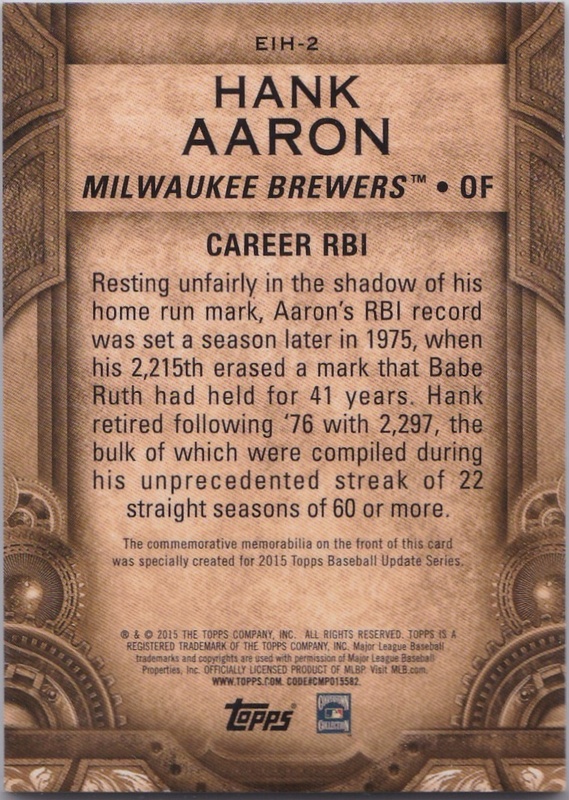 For Aaron, that record is career RBIs which he holds at 2,297 runs batted in. Like his home run record he had to top Babe Ruth's record and he did so during the 1975 season. Aaron led the National League four times in RBIs over the course of his career and he set a career high with 132 during the 1957 season. I have the Rickey Henderson and I couldn't believe how heavy/thick this card was when I got it. It makes an excellent paper weight.